Here are some additional ideas for how to use this feature. I'm sure you'll be able to think of many more! When developing your code, it's now easier to leave debugging statements in and turn them on with a simple flag. If you have code that's under construction and should never be run while you work on other parts of your program, you can now "IF 0" out the entire block. As a longtime C and C++ programmer, this reminds me of the "#if 0 / #endif" preprocessor directives as an alternative for commenting out blocks of code. Glad to see this in SAS! I have batch jobs that run daily, but that send e-mail to people only one day per week. Now this is easier to express inline with conditional logic. subject = "Weekly report for &SYSDATE." from = "SAS Dummy <sasdummy@sas.com>"
For batch jobs especially, system environment variables can be a rich source of information about the conditions under which your code is running. You can glean user ID information, path settings, network settings, and so much more. If your SAS program needs to pick up cues from the running environment, this is a useful method to accomplish that. As awesome as this feature is, there are a few rules that apply to the use of the construct in open code. These are different from what's allowed within a %MACRO wrapper. First rule: your %IF/%THEN must be followed by a %DO/%END block for the statements that you want to conditionally execute. The same is true for any statements that follow the optional %ELSE branch of the condition. And second: no nesting of multiple %IF/%THEN constructs in open code. If you need that flexibility, you can do that within a %MACRO wrapper instead. And remember, this works only in SAS 9.4 Maintenance 5 and later. That includes the most recent release of SAS University Edition, so if you don't have the latest SAS release in your workplace, this gives you a way to kick the tires on this feature if you can't wait to try it. The post Using %IF-%THEN-%ELSE in SAS programs appeared first on The SAS Dummy. SAS programmers are often asked to break large data sets into smaller ones. Conventional wisdom says that this is also a pointless chore, since you can usually achieve what you want (that is, process a certain subset of data) by applying a WHERE= option or FIRSTOBS=/OBS= combination. Splitting a data set creates more files, which occupy more disk space and forces more I/O operations. I/O and disk access is often the most expensive part of your SAS processing, performance-wise. I'm going to admit right now that this isn't the most efficient or elegant method, but it's something that most beginning SAS programmers could easily come up with. Writing the above program is easy, especially since there are only 3 different values for Origin and I've memorized their values. But if there are more discrete values for the "split-by" column, the task could involve much more typing and has a high possibility for error. This is when I usually use PROC SQL to generate the code for me. 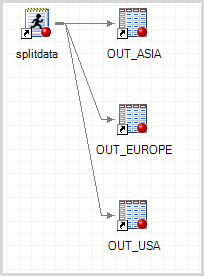 It creates a macro variable VALLIST that contains the comma-separated list: "Asia,Europe,USA". SELECT DISTINCT ensures that the results include just one record for each unique value of the variable. The CAT function concatenates a set of string values together. Note that CATX and CATS and CATT -- other variations of this function -- will trim out white space from the various string elements. In this case I want to keep any blank characters that occur in the data values because we're using those values in an equality check. The program calculates a name for each output data set by using each data value as a suffix ("OUT_dataValue"). SAS data set names can contain only numbers and letters, so I use the COMPRESS function to purge any invalid characters from the data set name. The 'kad' options on COMPRESS tell it to keep only alpha and digit characters. The resulting program statements all end up in the &ALLSTEPS macro variable. I could just reference the &ALLSTEPS variable in the body of the SAS program, and SAS would run it as-is. Instead I chose to wrap it in the macro %runSteps. This makes it a little bit easier to control the scope and placement of the executable SAS program statements. With a small modification, my example program can be adapted to serve any of these purposes. What about you? Are you ever asked to split up SAS data sets, and if so, based on what criteria? Leave a comment and tell us about it. Has this ever happened to you? You have a SAS program with statements that you wrote, then you make use of a macro function or %include file supplied by a helpful colleague, and when your SAS code resumes, you find that all of your SAS titles have been changed out from under you! But what about the titles and footnotes? Is there a way to squirrel those values away before usurping them, and then put them back the way that you found them? There is at least one idiosyncrasy of this approach: if your title or footnote includes a macro variable or expression, that macro will be resolved when the title is stored. So when you restore to the original value with %restoreTitles(), the value will be "stuck" as it was when you used %saveTitles(). If you dislike that limitation, then perhaps some hotshot macro programmer will add a solution here in the comments. A couple of years ago I shared a method for copying any file within a SAS program. It was a simple approach, copying the file byte-by-byte from one fileref (SAS file reference) to another. It's coded as a SAS macro, so it is simple to reuse -- similar to a function. It copies the file content in chunks rather than byte-by-byte, so it's more efficient. It provides good error checks and reports any errors and useful diagnostics to the SAS log. It's an excellent example of a well-documented SAS program! Bruno tells me that "copying files" within a SAS program -- especially from nontraditional file systems such as Web sites -- is a common need among his SAS students. I asked Bruno for his permission to share his solution here, and he agreed. Within hours of my posting here, Vince DelGobbo reminded me about the new FCOPY function SAS 9.4. With two filerefs assigned to binary-formatted files, you can use FCOPY to copy the content from one to the other. When I first tried it with my examples, I had problems because of the way FCOPY treats logical record lengths. However, Jason Secosky (the developer for FCOPY and tons of other SAS functions) told me that if I use RECFM=N on each FILENAME statement, the LRECL would not be a problem. And of course, he was correct. One of the great things about SAS libraries is that you can write your programs to read and write data without having to worry about where the data lives. SAS data set on a file system? Oracle table in a database server? Hadoop data in Hive? For many SAS applications, the programmer can treat these very different data sources in exactly the same way. ...except for the cases where you can't treat them the same, because they are different. These different databases have different capabilities and behaviors, and sometimes you need to optimize your SAS programs to take advantage of those differences. This simple macro peeks inside SASHELP.VLIBNAM, a virtual table that maintains the vital characteristics of all of the active SAS libraries in a session. The macro queries the table for the engine name for the given library, and places the result in a macro variable named &ENGINE. Here are some example uses and results. The first two calls are for built-in SAS libraries, which use the BASE engine (aliased to "V9"). The third call is for a MySQL library that I use for reporting on our WordPress database. A few months ago I released the Copy Files task for use with SAS Enterprise Guide. The task allows you to transfer any files between your PC and a SAS Workspace session, much like an FTP process. It doesn't rely on FTP though; it uses a combination of SAS code, Windows APIs, and SAS Integration Technologies to get the job done. It's proven to be a very popular task, because it can be useful in so many situations. It even earned a mention in a SAS Global Forum paper this year (and no, it wasn't a paper that I wrote). Today I'm going to point out the things that the task doesn't do so well. Or at least, that it didn't do well until I made some updates. My changes were based on two "complaints" from several SAS users. Read on for the details. But if you don't care and you just want the latest version of the task, you can download it from here. Complaint #1: Wildcards that are a little too "wild"
Can you guess the problem? What if I told you that the task stores your file specification in a SAS macro variable? Yep, it's that "/*" sequence in the value that trips things up, because SAS interprets it as the start of a comment. Left unchecked, this sabotages the remainder of the SAS code that is included in the process. The SAS macro experts are already shouting out the answer to fix this: use %STR to wrap the slash and "hide" the token from the SAS parser. That's a great idea! Except that the task relies on the SAS "internal" value for this value --and not the displayed value -- when it comes time to process. These values are different when %STR wraps a special character like the forward slash. The macro facility changes out this character with a hexadecimal character called a delta character. Notice the funky arrow characters. Is that what you were expecting? Now the task detects the presence of a forward slash (and some other special characters) and will automatically add the %STR so you don't have to. (But you can still use %STR if you want to.) And it correctly detects the delta characters, if present, to convert them back to their correct form before trying to use the value. Users of FTP might be familiar with binary versus ASCII mode for file transfers. Because UNIX line-endings are different than Windows line-endings for text files, transferring a file in ASCII mode helps to ensure proper line-ending behavior for the target host. The Copy Files task transfers ALL files using a binary mode. Why? Because in today's global workplace even text-based files often don't adhere to the limited English-centric ASCII standard. Attempting a text-based file transfer could result in encoding mismatches, so it's much safer to transfer content as "binary blobs". Scans the file to determine whether it's a text file. (This relies on the file content and not on special file extensions such as .TXT or .CSV.). Rewrites the file and replaces the line-ending characters as needed for the target file system (Windows or UNIX). To address this, I changed the "fix line endings" process to use lower level I/O functions that simply scan through the text files as a binary stream, byte-for-byte, and change the line endings as needed. Trying to decide on proper encoding is risky business, so I decided to leave the character encoding untouched. 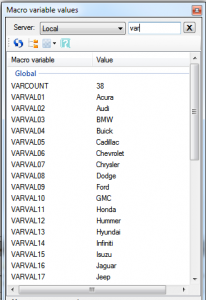 You might know about the many automatic macro variables that are available in SAS. They provide plenty of information about the SAS environment, such as the current user (SYSUSERID), the SAS version (SYSVER and SASVLONG), and the operating system where SAS is running (SYSCP and SYSCPL). That information is often useful for your SAS programs and reporting output. 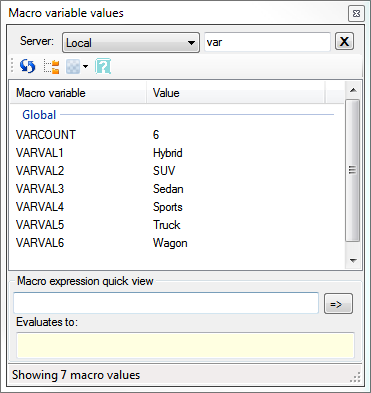 Did you know that SAS Enterprise Guide also generates several macro variables? These provide information about the SAS Enterprise Guide environment, which is often different than the SAS environment when you're connected to a remote SAS workspace. You can use these macro variables to code various logic tricks into your programs, such as to determine where the current project file resides and assign a library to its path. Here's the complete list of the generated macro variables (as of SAS Enterprise Guide 4.3 and 5.1). 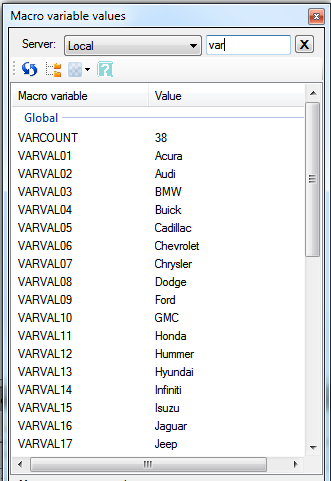 These macro variables are also generated in the SAS Add-In for Microsoft Office. You can always find this list in the SAS Enterprise Guide online help, which you access from the help menu. Simply search the keyword index for "macro". _CLIENTAPP Name of the client application. _CLIENTMACHINE Client machine node name. _CLIENTPROJECTNAME The filename for the project. _CLIENTPROJECTPATH The full path and filename for the project. _CLIENTTASKFILTER The filter that is defined for the task. You can use this macro variable in the titles and footnotes of the task, so that the filter information is displayed in the title or footnote of your results. _CLIENTTASKLABEL Label for the current task. This is the text label that is displayed in the project tree and the process flow. _CLIENTUSERID User ID of the client user. _CLIENTUSERNAME Full user name, if that information is available. _CLIENTVERSION Application version, including build number. _SASHOSTNAME Server node name (IP address or DNS name). _SASPROGRAMFILE The full path and filename of the SAS program that is currently being run. This macro variable is available only for SAS program files that are saved on the same server on which your SAS Enterprise Guide code is being run. _SASSERVERNAME Name of the logical server. And remember, you can easily see all of the available macro variables, along with their current values, by using the SAS Macro Variable viewer custom task. Earlier this week I described a common programming pattern in the SAS macro language. The pattern sets up a loop for processing each distinct value of a classification variable. 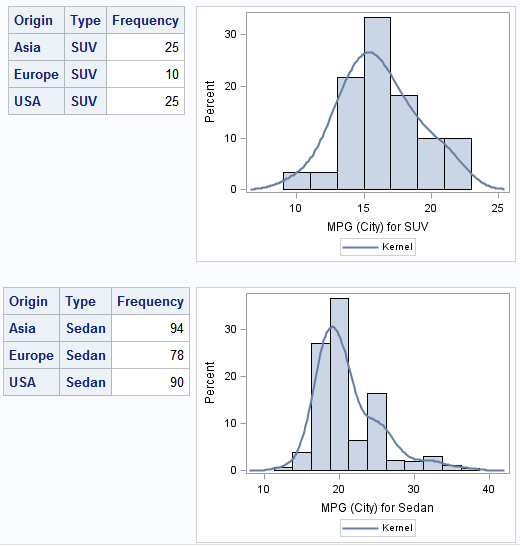 The program uses the PROC SQL SELECT INTO feature to populate SAS macro variables. The effect: you can roll your own BY processing in SAS. With the new SAS 9.3 syntax, we can now specify an open-ended range for macro variable names. SAS will allocate as many macro variables as are needed to store each value. The values will be TRIMMED of whitespace by default, but you can control this by specifying NOTRIM before the FROM keyword. Since we don't need to know the count ahead of time, we can then safely use &SQLOBS after the SELECT to determine the upper bound of our index. Most SAS procedures support the BY statement, which allows you to create a report or analysis for each distinct value of a variable in your data set. The syntax is simple, and SAS procedures are usually tuned to do a good job of processing the data efficiently. It's difficult to interleave BY output from multiple steps within your program. Let's take a simple code example through this transformation. Let's combine a PROC FREQ step with a PROC SGPLOT step. Here's the example without BY processing or classification. 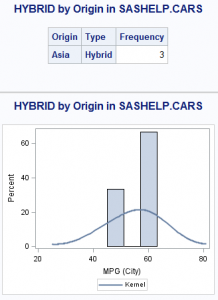 The results show a report and plot for ALL values of Type within SASHELP.CARS. It's okay, but it doesn't provide much insight into the different classifications of car Type (Hybrid, Truck, Sedan, and so on). I replaced "VAR" with my class variable, "TYPE". And I replaced "DATASET" with "SASHELP.CARS". That's it. UPDATE 26Mar2012: With new features in SAS 9.3, the above code pattern becomes even simpler. See how to improve on this SAS programming pattern. When I run just these statements in SAS Enterprise Guide, I can use my SAS Macro Variable Viewer to see how my macro variables were initialized. Now we've got the correct number of steps running, but the output is the same for each step -- not very interesting! We need to customize the program statements to use each distinct value of Type. Note how we need to reference our macro variable that contains the distinct value: "&&varVal&index." You need a "double &" to dereference (fancy word for reference the reference) the correct macro variable for the current index value. I added ODS LAYOUT statements (officially experimental, but works well in HTML) to generate two-column output, with tables and charts side-by-side. I added SYSECHO statements so that I can track progress of the program as it runs in SAS Enterprise Guide. If you've got lots of data with lots of distinct values, it can take a while. You might appreciate the running status message. And I added some ODS GRAPHICS options to control the name of the output image files, just to make my results easier to track on the file system. Here's an example of my final report. Can you take it even further? I'll bet that you can!